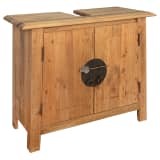 vidaXL Sink Cabinet Solid Walnut Wood 25.9"x11.4"x24"
vidaXL Bathroom Vanity Cabinet Solid Recycled Pinewood 27.6"x12.6"x24.8"
Is getting ready in front of the bathroom mirror a dreaded hassle every morning? If so, we have a fabulous solution for you! With a vanity table from vidaXL, you will never want for space, or deal with a fogged-up mirror again. You can store all your grooming supplies in one spot and speed up your morning routine immensely! Here at vidaXL, you will find various vanity tables that feature mirrors, drawers and a stool! 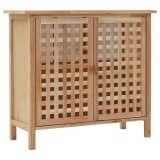 These fabulous furniture items, allow you to store your jewelry and grooming products in a far more organized way! 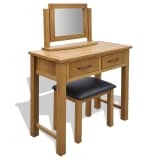 A dressing table with a matching stool will also make a wonderful and decorative addition to the bedroom. Because we have kept the color scheme neutral for these beautiful items, they will be sure to match the rest of your bedroom décor. In addition, there are classic as well as modern variants for you to choose from, all here at vidaXL! A vanity table is ideal if you spend a lot of time in the mirror and want to organize your grooming supplies and jewelry. These tables feature several drawers, allowing you to neatly organize and separate all your belongings. As well as the additional drawer storage space, the table top has ample space to display your absolute favorite items for all your friends to see!